Knowing how to post bail and get out of jail in fifteen minutes is darn handy for almost everyone. For a disoriented 18-year-old in a pinch, it’s downright necessary. College students are naïve, eager, and prone to trouble, and whether they’re funneling beer or fighting sweatshop labor, they need to know their rights. Just logging onto the university computer system, for example, opens a student to a host of legal questions about whether the school can monitor her email or her surfing habits or her blogs. But the amount of practical legal information available to the nation’s 15 million college students is extremely limited and most students don’t have ready access to lawyers. What they need is a handbook that will cover the issues they’re likely to confront, a guide that is informative, easy to read, and not embarrassing to have on their shelves. 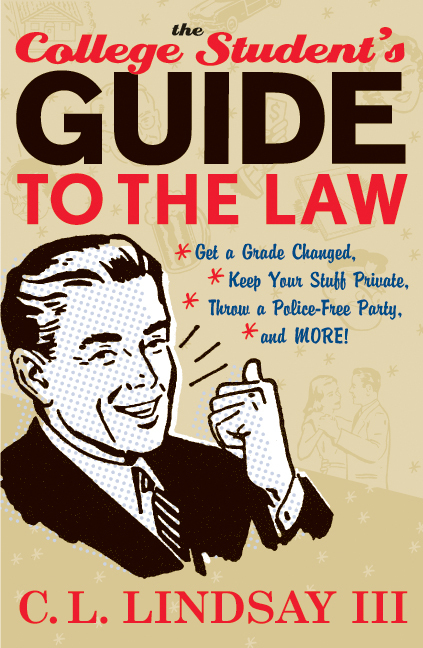 With a retro look and a humorous, approachable tone, THE COLLEGE STUDENT’S GUIDE TO THE LAW provides legal explanations, strategies for steering clear of problems, and detailed instructions about how to deal with the authorities—both educational and municipal—when trouble can’t be avoided. The book is divided into sections for easy access to information: “The Law in the Classroom” offers guidance on academic dishonesty, grading grievances, and professor-student relations. “The Law On Campus” discusses problems outside the classroom but on university turf, from privacy rights (whether in the dorms, on a hard drive, or in the Registrar’s Office) to interactions with campus security. “The Law Off Campus” provides advice on dealing with legal issues that are endemic to university life such as underage drinking policies, landlord-tenant disputes, and credit-card use and abuse. THE COLLEGE STUDENT’S GUIDE TO THE LAW ranks with the shower caddy, the extra-long twin sheet set, and the mini fridge as an absolutely indispensable item for every college freshman. And every returning student who might contest a grade, plan a campus protest, or sign an apartment lease—that is, every college student—will find this book an invaluable resource as well as a fun read.